Watches T-Touch Expert Dragon 2012 in honor of the year, the dragon! As patron of the new Chinese horoscope 2012 is a black water-dragon. Watches T-Touch Expert Dragon 2012 in honor of the year, the dragon! As patron of the new Chinese horoscope 2012 is a black water-dragon. 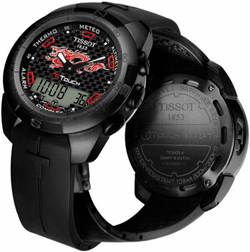 The company Tissot has devoted the main character of this year, a series of watches T-Touch Expert Dragon 2012. The novelty is represented by a black titanium case diameter of 43.6 mm. Dial – a carbon fiber in the “6” hours is an LCD electronic display. On the black dial highlighted red hour markers and red and white classic Chinese dragon. The novelty is designed based on the Swiss Quartz E48.351 mechanism with fifteen functions, many of which are in watchmaking have not received wide application – a barometer, altimeter, altimeter, compass, thermometer, etc. Hours are also equipped with a number of practical functions – lights, countdown timer, perpetual calendar, two time zones, and other waterproof models can descend to a depth of 100 meters. Watches T-Touch Expert Dragon 2012 are available on black rubber strap. They can buy from authorized representatives of the company for € 930.